If you have booked tickets for the excursions taking place on Wednesday, 30 August 2017, you will need a public transportation ticket*. Please make sure to purchase a ticket before the tour. *except for the Starnberger See Tour. A bus will pick you up for this tour . Airport-City-Day-Ticket - use this ticket for your arrival and departure day! The Airport-City-Day-Ticket is a day ticket for the entire MVV network. This ticket allows you to use all means of transport within the MVV, for example S-Bahn (urban trains), U-Bahn (underground), buses and trams. The Airport-City-Day-Ticket is valid until 6 am the following day. Where can you buy the ticket? You can buy the Airport-City-Day-Ticket from the ticket machines at the airport and at most S-Bahn (urban rail) stations. Select “MVV Münchner Verkehrs- and Tarifverbund” on the screen, followed by “Airport-City-Day-Ticket”. You can pay with coins, bank notes or debit card. The ticket machines at the airport also accept credit cards. Which lines run from the airport to the city? From Munich Airport, S-Bahn lines S1 and S8 run to the city centre. They run alternately every 10 minutes, with the S1 going via Munich West and the S8 via Munich East. The trip takes around 35 minutes. Multiday Tickets - use these tickets for your stay in Munich! If you want to stay for 2 days, 4 days or even longer, simply combine the 1-day, 3-day and 4-day tickets. How to get to the Gasteig? The easiest and most economic way to reach the Gasteig from Munich Airport is by taking the S-Bahn. Take the S-Bahn line S8 (yellow line in the Munich S-Bahn map) and get off at the station “Rosenheimer Platz”. The direction to the Gasteig is indicated on the signage at the platform. Please pay attention to loudspeaker announcements and info screens regarding schedule changes. From Munich Central Station, the Gasteig is only four stops by S-Bahn. Take any S-Bahn leaving in direction “Ostbahnhof” and get off at the station “Rosenheimer Platz”. The direction to the Gasteig is indicated on the signage at the platform. The most beautiful way to get to the Gasteig from the city centre is walking. Passing the Isartor, crossing the river Isar at the Ludwigsbrücke you will reach the famous Deutsche Museum. From there you can already see the red brick building of the Gasteig soaring on a small hill. 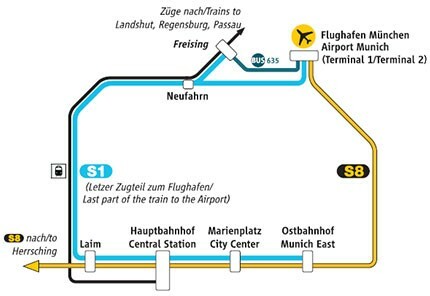 You can also get there by S-Bahn – from the station “Marienplatz” take any S-Bahn leaving in direction “Ostbahnhof” and get off at the station “Rosenheimer Platz”.